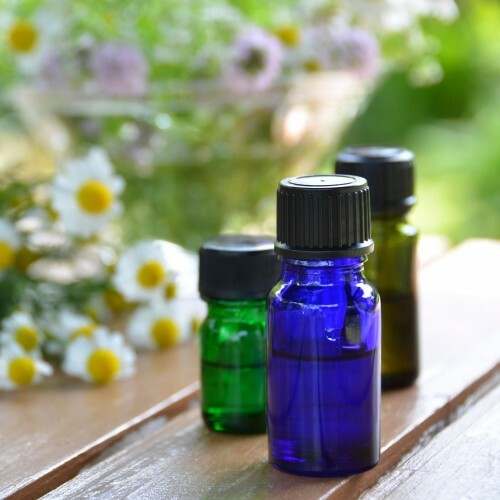 Essential oils containing the essence of a plant's fragrance have been used for at least two millennia to improve physical and emotional wellbeing. They can be massaged into the skin (as long as they are blended with a milder carrier oil such as olive or walnut oil), diffused with a spray or aroma lamp, or inhaled - for example if you have a cold and want to clear the sinuses you can add a few drops of eucalyptus to a bowl of steaming water, put a towel over your head and breathe in the vapour. Plants have different properties and can be used to treat different symptoms. Lavender is calming and promotes sleep, whilst rosemary has recently been proven to enhance the short term memory - very useful before an exam, for instance! Essential oils can be extremely toxic when taken internally, irritating when applied direct to the skin and can also be harmful to cats. Care should be taken to keep essential oils away from children.